In blogger you can add a popular posts widget easily from the gadget list in the layout option. Popular post widget show the most visited or the most popular posts of your blog in a manner which you want for example in if you want the popular post widget to show only titles of the posts it will show only titles, or title with images/thumbnails and post title with image and a short summery. You can also select the number of post to show. Maximum number of posts which a popular post widget can show is ten and the minimum is one. Popular post widget helps the visitors to reach the most viewed pages on your blog. It also helps you to increase your page views and blog traffic. 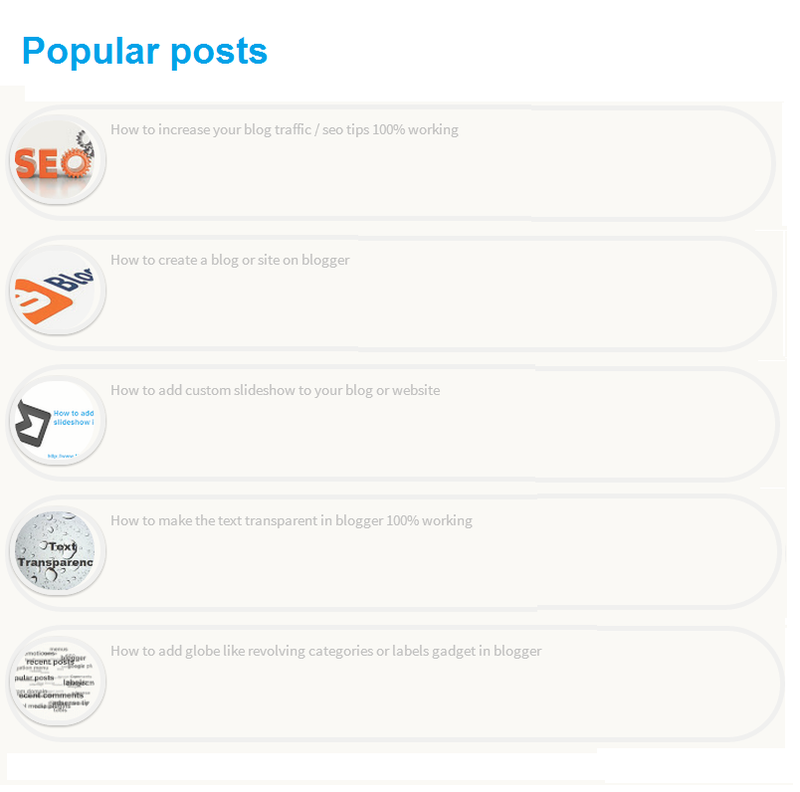 Why should I add a Popular post widget to my blog? 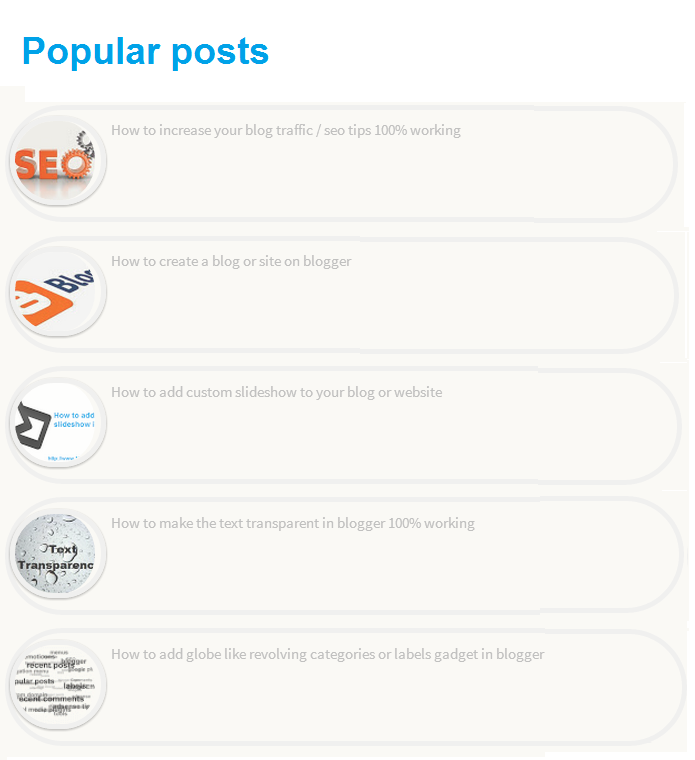 Popular posts widget helps your visitors to navigate through your blog's posts. Popular posts widget attract visitors to read more and increase your page views. If you are using ads on your blog it will help to increase your income and subscribers. (1). Go to blogger and log-in to your your account. (2). Go to layout and click add a Gadget a pop-up window will open search for Popular posts, select number of posts and click save. (3). In the third step you have added the widget and in this step you have to customize it to make it look cool as in above image. Click get code to get the customization code. (4). Copy the code and go to Template and click customize. (5). After following the step four you will be redirected to the customization page of template, now click Advanced which is the last option of the customization page. (6). Paste the copied code in Add CSS tab and save the template. Congratulations! you are done. You can further customize this widget by changing the border colors of thumbnails and posts the default color code is #eee. Replace it with the color of your own choice. You can't customize it more than changing the border color otherwise it will either not look good or will not work. If you have any problem regarding this post ask me in comments. Don't forget to subscribe for latest updates. share this interesting widget with your friends and spread 101Helper.